Adrian and I went on a road trip to Marble Falls this weekend. My first one since I’ve been released from my surgeries. It was so nice to just get away and enjoy being together. It is a beautiful drive down 281 to Marble Falls. The blue bonnets are already out there and there were several places that had the Indian paint brushes along with the blue bonnets. We washed the car, loaded up and put Bob Seger’s greatest hits on the iPod. (Yep, we’re old). We sang (off key) and danced in our seats most of the trip. People were looking at us like we had lost our minds, but we didn’t care. We were together, in a fast car with good rock n roll, gorgeous scenery and ready to enjoy 18 holes of golf and some yummy seafood after golfing. We had a fantabulous time. We laughed until we snorted. And after a wonderful breakfast buffet at the hotel, we headed home. But we had a stop planned on the way. A place called Pottery Ranch-the Gettin Place in Marble Falls. We have been there a couple of times and I’m always excited to go back. If you haven’t been there, you should put it on your bucket list. Or at least Google it. You could spend a week in there and still not see everything. And I do mean they have just about everything. Jewelry, crosses, pottery, pictures, furniture and every kind of what not that you can imagine. Rufus, a chocolate lab is the official greeter. He’s been greeting visitors there for years. Today, we also met Stevie Ray, a lab puppy. I think he’s in training to become the next greeter when Rufus retires. And when you make your way outside to look at all the rustic furniture, you will also see Merlot, their miniature horse. And the two donkeys, Pancho and Lefty. Anyway, last time we were there, we got a big wooden table cross and two huge maps. One is a Texas state map from 1836 and the other is the Lonesome Drive cattle trail map. We are HUGE Lonesome Dove fans. We’ve probably seen the movie 50 times. Enough so that we know all of the dialogue. And we tend to use the movie phrases when talking to each other. For instance, if one of us says July, the other will say, “July! July is in Texas Peach”. And it never fails to crack both of us up. It’s nice when your spouse is the same kind of weird as you. 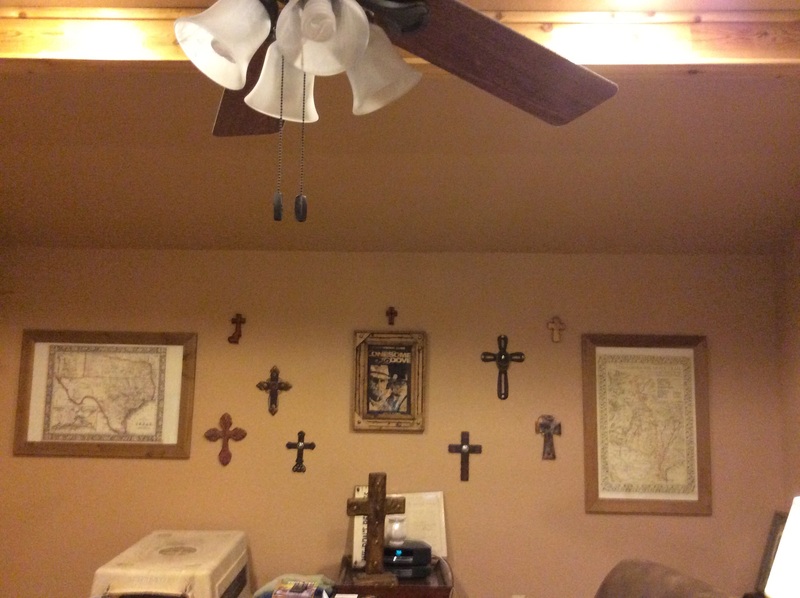 Adrian made me frames for the maps this past Christmas and we hung them in the den. So, I had a mission today. I wanted two things. That’s it. The first was a cross for my vanity. The second was a reprint of the letter that Travis sent from the Alamo. I thought it would go great with the maps. Well, I found those two items. And then we found a corner that had framed pictures from Lonesome Dove. We (or rather our wallets) were toast. When we loaded up the car, this is what we had: the cross and the letter. A metal dachshund (the W’s, remember), THREE framed pictures (a pic of of Augustus McCrae, Woodrow F Call and then one print of both of them with Jake Spoon and last, but surely not least was a wooden plaque that says “We Don’t Rent Pigs”. If you’ve seen the movie, you will understand that line. Those will all go in our den. So, suffice it to say, we got quite a bit at The Gettin Place. I’ll post a picture when we get the new stuff put up. I will post the picture of our wall that we did right after Christmas on this post. And if you ever go through Marble Falls, make sure of two things…. the blue bonnets are out and you stop by The Gettin Place on 281. And make sure that your trunk is empty. Better yet, take a pickup truck. You’ll be glad that you did.